Day 782 or should I say 7?! 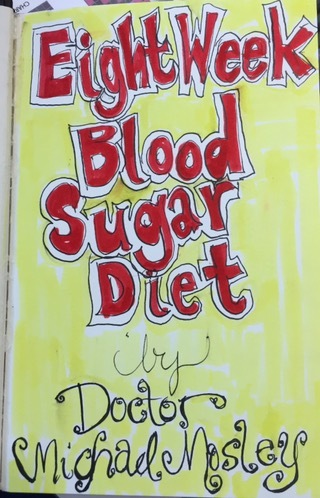 Title page of my strathmore 500 mixed media diet journal so far. Day 7 of my 8 week blood sugar diet. I got on the scale yesterday am and after only FIVE days I had Lost SEVEN pounds. I was totally shocked. I have already drawn day 6. But I still have to color it. I have tried substituting my Winsor newton watercolor markers which are NOT fugitive. They just don’t give me the same effect. Guess more practice is required. Strathmore 500 Mixed Media sketchbooks. My hands down favorites well except for Stillman and Birn but I can not get them here. I guess I should get extras when I go to Atlanta. I can buy the Strathmore with coupons at Michaels so that’s what I tend to use. I have only one complaint about them. Neither of them lay flat like moleskines do. And some pages they really don’t lay flat. 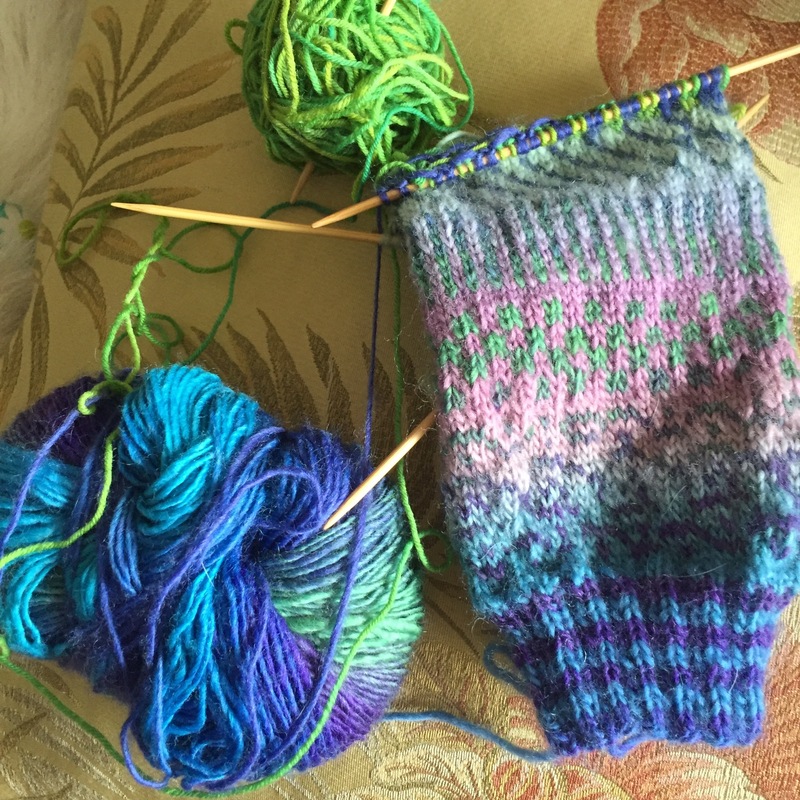 Sock knitting has slowed down. Hoping now that I seem to over the fatigue from lack of carbs I will get back to these. Anyway off to walk and climb stairs. Just realized it’s ten am and I haven’t eaten. And I am not hungry. Hmm. Only 49 days left !! 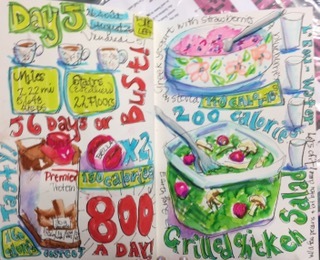 Day 783 – How many ways can I say busy?! 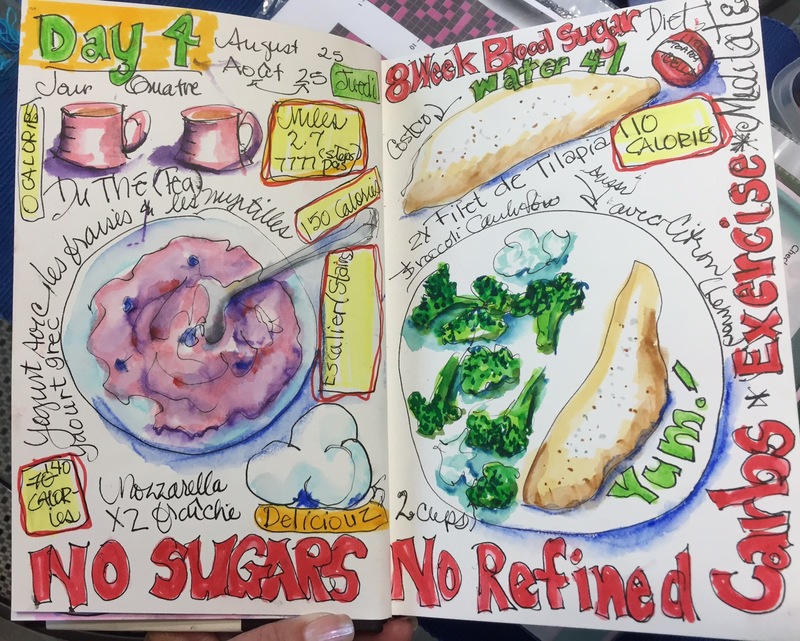 I see that you speak French in you pages of menus, fraises et myrtilles, yaourt, dates in french also…so keep it up whith your diet, it fun to see you find another reason to draw…it is fun. question for you, what is you call moleskine compare to Strathmore i have a Michael in the city not too far from my village. If you can tell me materials you find at Michael and that you love, tell me please , thank’s ! Strathmore is my favorite sketchbook. I buy them at Michaels. and you talk also of moleskine ? Do NOT buy moleskines. Terrible cheap Chinese paper. Practiquer mon francais qui est limitee.